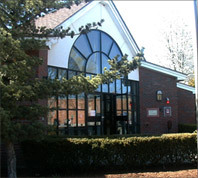 The Norton Public Library exists to provide a patron-friendly environment where people of all ages can find resources on a broad array of topics to support their desire for informal learning and recreational enjoyment, where they can gather information on personal, work, or school-related topics, and where they can interact with others during meetings and programs. We see the library as the hub of the community: bringing the community into the library and the library into the community. The Norton Public Library grew out of the Norton Magazine Club, a private organization begun in 1879 by local residents. The free lending library became a Massachusetts corporation in 1886. Through the generosity of all Norton citizens including benefactors Eliza Wheaton and the Balfour Foundation, the library has expanded its collections and facilities over the past one hundred and twenty-two years and now resides in the modern building on East Main Street dedicated in 1991 with the adjacent Library Park opened in 1999.